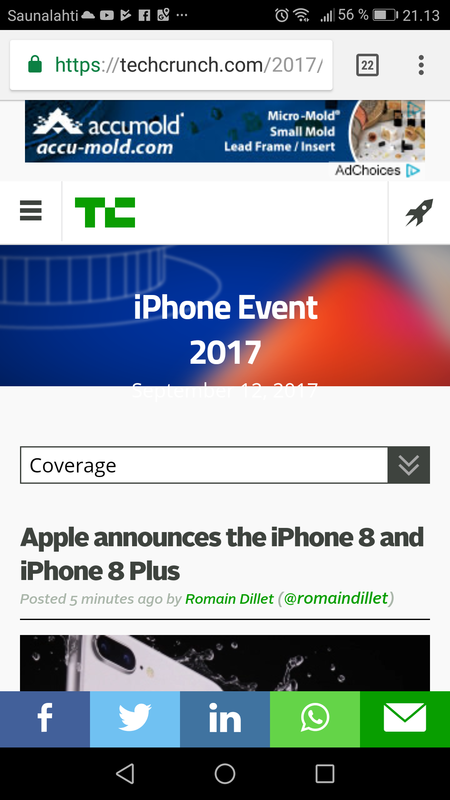 Apple just unveiled the iPhone 8 and iPhone 8 Plus at its press event. Several months after Apple announced the new and improved iOS 11 at Wolrdwide Developers Conference, the company is at long last gearing up to release the revamped version of its operating system for mobile. But there might be a nasty surprize in store for some iPhone users. While Apple has been running beta tests with the latest iteration of iOS for some time now, updating to the official version 11 could slow down – and perhaps even make unusable – a series of apps that are yet to be optimized for the new release. As spotted by some users on Twitter, Apple has added a section in Settings where you can view which apps are already compatible for iOS 11. Apple’s latest iOS version is out today – iOS 11 – but before you rush into updating, you’ll want to check that it doesn’t destroy any of your favorite apps. Apple being Apple, it has decided it doesn’t care very much if your apps crap out. After all, it’s the developers’ fault for not loving Apple and its fans enough to update their code – and programmers have had plenty of warning. In late 2014, Cupertino told developers that from February 2015 onwards, all iOS apps must run on a 64-bit OS, and since mid-2015, all new and updated 32-bit-only apps have been turned away from the App Store. I want to be clear. I’m not an iPhone H8r. But I’m going to call the iPhone 8 what it really is: the 7s that never was. Every other year, Apple has, historically, released an “S” version of the iPhone, like the 5s and 6s. The “s” stands for “better, but mostly the Same” (which I made up but doesn’t take away from its truth). This year, Apple skipped the “S” model of the 7, and went straight to 8. Apple’s new Series 3 smartwatch starts shipping this Friday, and the biggest feature change between last year’s model and this new Watch is that it has built-in cellular capabilities. Except, that cell service isn’t entirely reliable. While writing my review of the Apple Watch Series 3 with LTE capabilities, I experienced notable connectivity issues. The new Watch appeared to try to connect to unknown WiFi networks instead of connecting to cellular, when I was out and about without my phone. Unfortunately, we still don’t know when that software release is expected, or exactly how it will fix the issue of the Watch connecting to cellular networks when it’s supposed to. Apple has confirmed that Bluetooth and Wi-Fi are not fully disabled when toggled off in Control Center on iOS 11. Even when toggled off in Control Center on an iPhone, iPad, or iPod touch running iOS 11 and later, a new support document says Bluetooth and Wi-Fi will continue to be available for AirDrop, AirPlay, Apple Pencil, Apple Watch, Location Services, and Continuity features like Handoff and Instant Hotspot. Toggling off Bluetooth or Wi-Fi in Control Center only disconnects accessories now, rather than disabling connectivity entirely. Just as the Apple Watch was set to go mainstream, bugs and poor design choices have taken the shine off the latest version of the hardware. Apple Watch has been the only Apple product to get a price cut since Brexit, which saw some prices rise by over 20 per cent. The Series 2 42mm was £399 prior to the product launch last week, but now the equivalent Series 3 is £359 (the 2015 original drops to £249 and £279). In two and a half years, Apple has improved the battery life and UI enormously, focused on health and is pushing those benefits hard at businesses with the sinister-sounding “Corporate Wellness” scheme. So all was set for the Watch to appeal to a broader demographic than Apple and gadget enthusiasts. Watches that don’t tell the time have been normalised. But what Apple hoped would be a differentiator – LTE – now threatens to tarnish the brand. As I wrote after the first rumours of an LTE-capable Apple Watch surfaced, a 4G Watch is “fun… for about ten minutes”. Only analyst Richard Windsor was bold enough to point out that 4G cellular makes a product worse, not better. “Putting an LTE modem is pointless and could even harm what little appeal the product has,” he predicted six weeks ago, and reading the first reviews of the Watch, his reasoning was spot on. Uncannily so. That said, the bugs and design choices are very unlike Apple, and largely unenforced. Inside the market for 3D sensing technologies. 3D sensing is a buzzword that has been thrown around quite a bit this year in connection with the rumors surrounding the tenth-anniversary iPhone. Although the iPhone X will be the first large-scale consumer push for 3D sensing, the technology has been around for years, particularly in industrial applications such as machine vision. 3D sensing is already used in the PC – think Intel’s RealSense 3D camera. For the iPhone X, the TrueDepth 3D camera will be used for facial recognition, referred to as Face ID, replacing Touch ID as a method for unlocking the phone and for mobile payments. 3D sensing is accomplished with either Time of Flight (ToF) or Structured Light technologies. Gesture recognition is achieved by passing an infrared light source through an optical device to spread the light through an entire space, such as a room, to measure the light reflected off of objects. It enables users to control a device without touching it or using an input device like a remote control. In order to be precise enough to track small movements anywhere in a room, “time-of-flight” techniques are used. Time of flight has the advantage over other ways of tracking reflected light that rely on the quantity of light reflected back; black targets will reflect back less light than white ones, even though the distance from the sensor is the same. Time of flight tracks how long it takes the light to reflect off the target and back to the sensor. iFixit’s teardown of the new iPhone 8 confirms that the screen and battery remain relatively replaceable, despite the addition of Qi-compatible wireless charging coils in the unit. Overall the site gives the 8 6/10 for repairability… the same score as last year. The iPhone 3GS in 2009 was given a 7/10 and only needed three tools, and one screwdriver. It’s a different story these days. Externally the 8 looks the same as the 7, and the 6s and 6 before it; the design has not really altered since 2014. Another Apple launch has been and gone, and as usual, there are some teething problems as users adjust to the latest updates. One of those issues bugging people to the core is iOS 11 battery drain. Reportedly, within about a minute of Apple’s iOS 11 release, it was already installed on more devices than the latest version of Android. And it’s easy to see why people were eager to install it. iOS 11 boasts some impressive new features, enhancements, and our favorite – security patches. But here’s the catch. Some iPhone and iPad users are reporting installation problems, slow speed, issues with Bluetooth and Wi-Fi and one that caught our eye specifically – faster battery drain. A new report from mobile security firm Wandera exposes the issue: iOS 11 a battery killer. Cutting through the usual subjective battery life complaints iPhone and iPad users often post online after an iOS update, Wandera found concrete evidence of serious degradation. Breaking this down, Wandera reports iPhones running iOS 10 can be used for 240 minutes on average before the battery dies. Meanwhile iPhones running iOS 11 last just 96 minutes on average – a massive 60% decline. While the iPhone 8 retains the same unremarkable design for the fourth year running, the internals are a different story. Thanks to extraordinary improvements in semiconductor design, it has been able to shrink the capacity and size of its battery pack, while opening up a significant performance lead over Qualcomm and Samsung. The six-core CPU A11 is now complemented, for the first time, by an Apple-designed GPU. Apple can now support 4K at 60 frames per second (fps) and 1080p video at 240fps. Top consumer camcorders costing around $1,000 from Sony and Panasonic can’t match either frame rate. They don’t even come close. Last year Apple extended its benchmark lead over Samsung; in single core tests, the 2015 Apple iPhone 6s outpaced Samsung’s 2016 Galaxy S7. But this year it has simply become embarrassing. On Geekbench 4, tests conducted by Tom’s Guide show the iPhone 8 is 54 per cent faster than the Galaxy Note 8 (which uses Samsung’s own silicon), and the OnePlus 5 (which uses Qualcomm’s Snapdragon 835, the choice of many Android flagships). The new iPhone 8 also comfortably outperforms laptops: a MacBook Pro 13-inch A5 and a Dell XPS 13. As Apple goes wireless with its latest iPhone, here are some tips and answers to questions you may be asking yourself. Having been involved with the wireless power industry since before the first mobile phone adopted wireless charging and before the Qi or AirFuel standards existed, here I hope to provide some clarity and tips to companies looking to capitalize on the opportunity that Apple is magnifying. Apple’s adoption of wireless power in the new iPhone will amplify the demand for public charging points. Some companies like Chargifi and AirCharge are providing mobile apps that show people where their nearest wireless charging stations are located. Chargifi has found that the average charging session on their network is 43 minutes and 17 seconds.
. However, there has been some apprehension for a wide-scale rollout due to uncertainty over wireless power standards. Apple’s decision to join the Qi standard ends the debate. Wireless power adds safety, convenience, and one-handed drop-and-go charging versus two-handed plug and un-plug operation. Wireless charging removes potentially dangerous cords from the car’s cabin and it lends naturally to consumer behavior to place phones in the center console or cup holder—now with the benefit of charging their device while doing so. I believe that wireless power will become nearly as ubiquitous as cup holders inside of vehicles. Apple Watch Series 3 shows little change from Series 2 Watch, some redesign to accomodate LTE, and 1.07 watt-hour battery, up from 1.03 in Series 2 Watch — Tools Featured in this Teardown — Introduction — The Apple Watch is one step closer to a super spy accessory with its Series 3 capable of making phone calls. With innovations like wireless charging under the hood, can the iPhone 8 and 8 Plus overcome the pesky repairability issues of their new glass backing? Apple loves frantic terms for the techniques it uses. For the latest iPhone, one of the new terms was TrueTone, which is better referenced to the eye-color display. It is based on the sensor circuit of the Austrian ams. It’s about the XYZ sensor of the surrounding light, which ams officially introduced last week. It senses the surrounding light five times more precisely than the RGB sensors so far. The TCS3430 sensor can be used for display management, automatic white balance and color management. In practice, the sensor eliminates problems with present-day smartphone and other displays to produce eye-catching colors under different lighting conditions. Jennifer Zhao, head of the optical sensors group at the ams headquarters in Graz, said that the XYZ sensor distinguishes image information on five channels: X, Y, Z and two infrared channels. The latter two are handled to detect the light source. The Y channel measures the green area of ​​visible light and produces a color force value, which allows the TCS3430 to act as a sensor of ambient light. Where the RGB sensor only distinguishes red, green, and blue, the XYZ model better matches the ability of human eye cell cells to see the colors and the shades close to the main colors. These shades change according to the color temperature of the surrounding light. A real test with all-day applications that pitted the iPhone 8 Plus against iPhone 7 Plus, shows that the new phone from Apple is actually slower than the previous generation. On paper, the iPhone 8 Plus is better in pretty much every way than the previous generation of devices from Apple. On the other hand, in a day-to-day scenario, it turns out that it’s slower and not all that well optimized. Besides finishing a full minute after the older iPhone, Apple’s iPhone 8 Plus also seems to lack proper memory management, closing apps opened in memory to make room for others. It’s quite possible that the phone will be better with further updates and optimizations. Samsung Galaxy Note 8 is also doing better than iPhone 8 Plus, so those optimizations need come really quick if they exist. Samsung has a great opportunity to make money with Apple’s iPhone X smartphone. According to the research firm Counterpoint Technology Market Research, up to $ 110 each for the iPhone X sold. Based on Counterpoint’s estimate (Apple’s payment), Apple will sell some 130 million iPhone X smartphones, with which Samsung can receive more revenue than the approximately 50 million Galaxy S8 smartphones that the company sells itself. Samsung also manufactures iPhone X’s display as well as the device battery and capacitors, Softpedia writes. Samsung Says Counterpoint estimates that approximately $ 202 per piece of Galaxy S8 smartphone itself is manufactured. Taking into account iPhone X’s expected sales volumes, Samsung is in the hands of a real gold mine. With the latest iPhone 8 models, Apple has introduced a revolutionary fast download that has been on the Android and Windows side for a long time. iPhone 8 comes with only 5 watt Base Charger. If you want to use a power-delivery USB-PD (Quick Delivery) solution, you need to hook up the adapter between the USB-C connector and the iPhone Lightning connector. With this kind of cable, the iPhone can connect Apple 29, 61 or 87 watts to USB-C chargers. The Appleinsider test also included a Belkin wireless charging platform that Apple markets. Its power is 7.5 watts. In addition, the download speed was tested with the 12-watt charger supplied with the latest iPad Pro models. The results are quite expected. USB charging with a 29 watt charger is clearly the fastest. In 30 minutes, the quick charge will fill the iPhone 8 battery by 52%, which means that Apple’s promise is even slightly exceeded. Qualcomm supplied the LTE modem in the Apple Watch Series 3 as well as a handful of other wireless chips, according to a teardown from TechInsights. The latest watch appears to continue to push the boundaries of system-in-package design, packing a dozen major chips and dozens of discretes. The new watch uses the same size SiP as the existing device. However, the Series 3 clearly packs more components, TechInsights said. TechInsights found the Qualcomm MDM9635M, a Snapdragon X7 LTE modem in the 42mm sport band model A1861 with GPS + cellular it opened up. The same LTE chip appeared in the iPhone 6S/6S Plus, the Samsung Galaxy S6 Edge and other handsets. The modem was mated in a package-on-package with a Samsung K4P1G324EH DRAM in the watch. Initial reviews found problems using LTE on the device, Apple’s first watch with cellular connectivity. However, Apple issued an update of its WatchOS said to have eliminated the problems. MacRumors brings us this depressing news after it obtained a new report from Ming Chi Kuo, widely regarded as the ‘best Apple analyst on the planet’. Kuo states that iPhone X stock will be extremely limited until well into 2018 and that will cause Apple to miss its widely predicted 2017 “super cycle”. Why? Kuo says Apple has run into significant problems mass producing the ‘TrueDepth’ camera sensor the iPhone X uses for its Face ID facial recognition system. Consequently Kuo believes sales of Apple’s new 2017 iPhones (iPhone 8, iPhone 8 Plus, iPhone X) are unlikely to break any records with total iPhone sales for 2017 coming in at 210-220 million units. The better news is Kuo states iPhone X production issues will be “significantly addressed” during the first three months of 2018 and this will see shipments “pick up strongly”. It is worth pointing out stock of new iPhones is often limited straight after launch, but never to this extent. Apps using Apple’s new ARKit, an augmented reality (AR) framework, have been installed more than 3 million times worldwide since iOS 11 launched on 19 September, according to Sensor Tower. The category with the most ARKit-only apps is games, comprising 35 per cent of total installs and 62 per cent of total revenue. “We expect to see a more diverse range of app types as developers have more time to explore new concepts suited to AR,” the company said. Australia-based PlaySide Studios created a virtual pet app called AR Dragon which Sensor Tower said is “the breakout hit of ARKit-only offerings available”. It accounts for more than 20 per cent of downloads among the top ten free ARKit-only apps. Apple said customers can now browse in-app purchases directly on the App Store and start a purchase even before downloading the app, helping it to gain exposure. Developers can promote up to 20 in-app purchases, including subscriptions, on the product page. App Store customers have now downloaded more than 180 billion apps and the platform receives more than 500 million unique customer visits every week. The tech giant recently revealed developers earned more than $70 billion since the App Store launched in 2008, and overall downloads grew more than 70 per cent in the 12 months to 1 June. It doesn’t guarantee the phone will be in stock. While initial pre-orders for the iPhone X are still a week away from opening, some Apple die-hards will be able to get started early. Apple’s installment-based Upgrade Program that lets customers get a new phone every year will, just like it did with the launch of the iPhone 8 / 8 Plus, allow members to get their loan paperwork in order starting on Monday. Apple says iPhone X will be available for walk-in customers at retail stores on launch day, Friday November 3, encourages customers to “arrive early” — Apple today announced that stores will have iPhone X available for walk-in customers, who it encourages to arrive early, on launch day. iPhone X will go on sale in more than 55 countries and territories on Friday, November 3. On the same day, the first deliveries will begin to customers. iPhone X pre-orders begin this Friday, October 27 at 12:01 a.m. Pacific Time. Due to a mix of reported production issues and strong demand, in-store availability of iPhone X will likely be extremely limited. Prospective buyers should be prepared for the possibility of waiting in long lines.